Carolina OA » Archive » 104 All Events Flap….eS or S? 104 All Events Flap….eS or S? Why? Here’s why…. Both pieces are made to be issued as one piece snapped together. 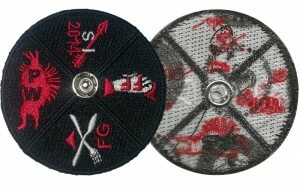 The wheel patch is definitely an “eR” since it has all of the evils on it…date and event names although they are abbreviated due to the size of the wheel. The flap has “All Events” ghosted on it and an arrow with “Today’s Event” pointing to the corresponding event on the wheel that shows through the flap opening. 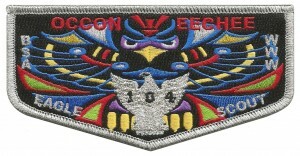 Therefore, it is listed in A Patch Collector’s Guide To Occoneechee Lodge 104 as an eS2014-3. The 66 members received one of the sets for free and were allowed to purchase a second, which by the way all 66 did! For those that care to collect different backings, it was discovered that 10 of the eR’s had a white backing and the remaining 135 had a black backing. 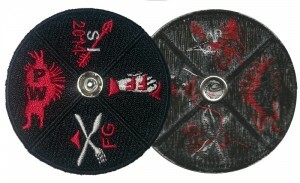 The remaining sets were put into the Lodge’s patch auction collection for future auction. I’d bet we have more that purchase the “All Events” pass next year! 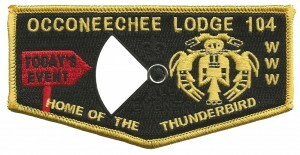 More patch news coming soon pertaining to the Lodge’s Trade-O-Ree August 22-23, 2014 at Camp Durant. If you need info on renting tables or a cabin, contact me at: ggrimes104@embarqmai.com You do not want to miss this TOR….I promise!!! I would call the “all events” flap an eS issue, too, for a simple reason. The flap says “All Events” right on it.